This story was told to me by a coworker. It is a little bit of local lore and shows the colorful history of the South. 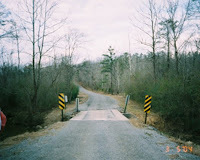 Cry Baby Hollow is located just outide of Hartselle by Decatur, Alabama. It is said that long ago, when white people were a new addition to this area a local Native American Woman was taking a walk with her baby. She carried the baby on her back. Cry Baby Hollow is apparently prone to flash flooding and the young mother clearly didn't expect the torrent of water that swept her and her baby away. The young mother survived the flash flood, but her baby did not. He was swept away down the ravine to his death. The local legend is that the baby still haunts this place. His ghost lingers waiting for visitors and if you leave a candy bar on the tracks by the hollow and walk away, when you return, it will have been claimed by the ghost of the lost baby.